Don’t skip out on Bulb Boy ($0.99). This iOS port of the 2015 grotesque-comedy-horror point-and-click adventure game is incredibly charming, when it’s not trying to weird you out. It’s not very difficult to beat, but it also doesn’t overstay its welcome. The premise has you playing as the eponymous Bulb Boy, who finds the house he’s staying at with his frail grandfather and flying bulb dog suddenly invaded by monsters, or perhaps some kind of symbiote from outer space. Bulb Boy wakes up, and there’s suddenly weird arms coming out of the walls, giant headless chickens, and at least one giant poop monster. No joke. This is a game that’s definitely got a flavor for the grotesque, and it’s got horror elements to it as well. And the only way to solve the problems here is by collecting items, and using them on objects in the environment, experimenting to figure out what works! Just like any good point-and-click adventure. Bulb Boy’s head can come off of his body, and that plays a role in many puzzles; early on you have to avoid getting thrown about by those arms coming out of the floors by hopping along the chandelier. 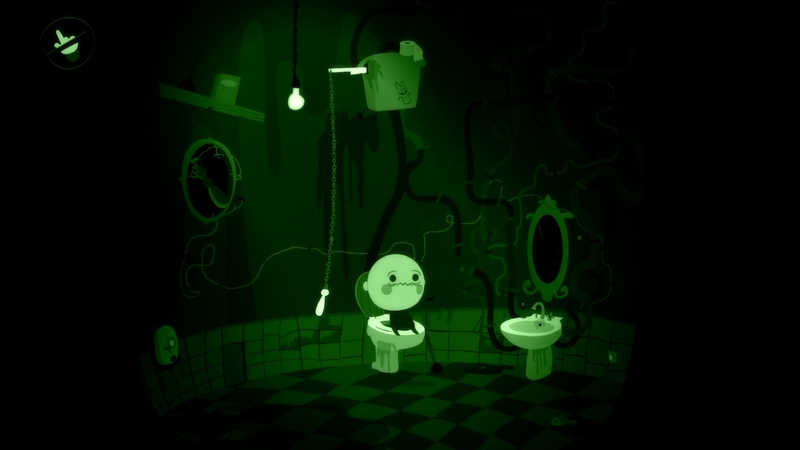 Because of the versatile nature of Bulb Boy himself, the game goes into some varied environments and uses the character in ways that you might never expect the game to go. That’s the excellent thing – this game keeps throwing new tricks at you and it kept surprising me along the way. There’s two-character puzzles, dodging challenges, timing elements, just all sorts of things that make sure you never quite know what’s going to happen. The production values are strong, with a monochromatic color scheme that is used quite well, mostly creating a green world that changes only when necessary. The animation is quite fluid, and there’s a use of selective detail in aspects like close-ups that’s reminiscent of modern cartoons. The music and sound design is exceptional, though I feel like the game isn’t great with headphones. Positional sound feels too much like it’s panned to one side or the other to a point that it doesn’t work well with headphones. Granted, headphones have this problem as it is because the point of stereo sound is that each ear hears some of what the other speaker is putting out, but I rarely notice it as an issue in other games as I did here at times when it happened. Beyond that, this is a gorgeous product. It’s interesting to compare this to Day of the Tentacle Remastered ($4.99) which recently released on iOS. That game is far more obtuse and obscure than this one is, though Bulb Boy is a willing to let you die. But still, Bulb Boy‘s puzzles are never too complex, and each scene is self-contained, so you never have items that are left over in any way. A few solutions might be a bit tricky to sort out, and at least once a bug made it impossible to complete a level until I restarted. But still, it’s clear to see where modern point-and-click game design has come in you’re tested, but not frustrated. 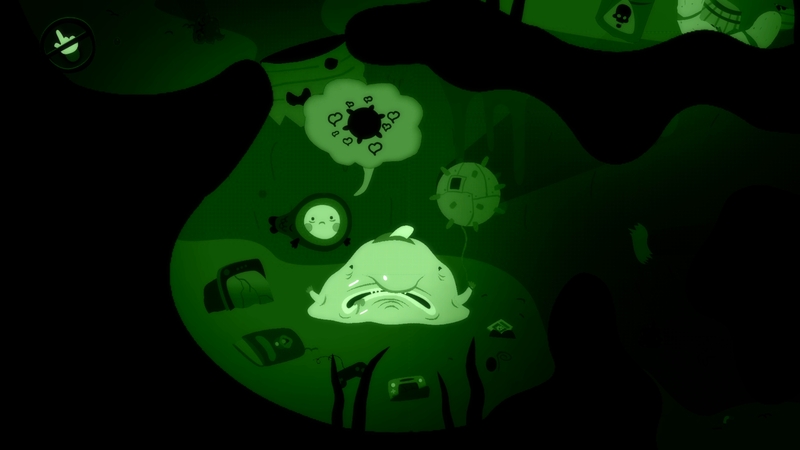 The hint system is implemented well into the game, as well, with a dream bubble popping up above Bulb Boy that points toward what you need to do next. Aficionados that enjoy their adventure games with a stiff challenge will be disappointed, particularly as there’s not any need to combine items. Really, this is more about experiencing the world than solving the puzzles. The game plays well with touchscreens despite being initially made for PC, with no need for hovering at all. You can tap and hold with two fingers to reveal any interactive objects, and everything else just uses one finger for pointing and dragging. Bulb Boy does a great job at balancing out the grotesqueness inherent to its theme and identity, with a certain sweetness. Bulb Boy is a child, and gets scared, and happy when he does well. He’s a goofy little character portrayed in such a way that you empathize with him, along with his dog and grandpa. This is what really propels the game along, that you care about what’s happening and feel bad if you accidentally let Bulb Boy die. You want him to succeed, and you are his steward in that regard. The characterization also kind of grounds the weird and gross-out aspects, of which the game has plenty. 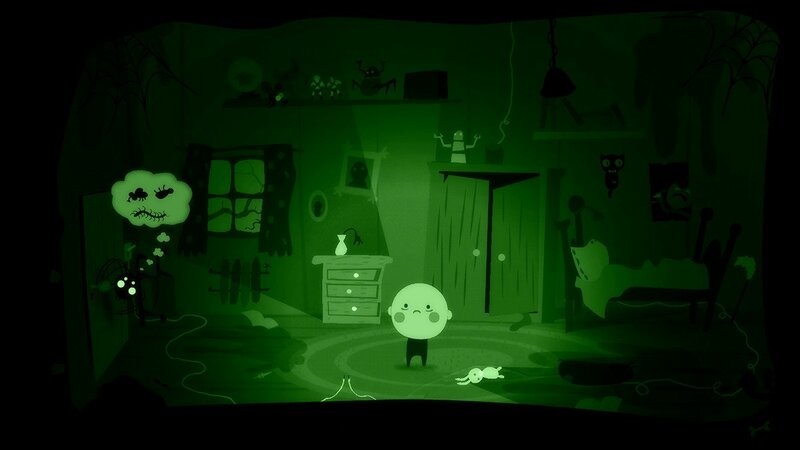 I’m not a huge fan of horror or gross-out aspects, but Bulb Boy does a lot to overcome any hesitance I have there. Admittedly, Bulb Boy is a bit on the short side, as you can beat it in a couple of hours without too much difficulty. Walkthrough videos can be found online, too, if you do get stuck at any point, due to the game having released on PC before this. It’s not the best point-and-click adventure game you’ll ever play, nor is it the lengthiest experience. But it’s got charm in spades, and is a great way to spend a couple of hours.